2017 has been an amazing year for the Starts at Home campaign with hundreds of housing associations and people celebrating and advocating for supported housing. The Starts at Home campaign aims to ensure that people who need extra support will always have a safe home that meets their needs. Now in its second year, Starts at Home aimed to build on the successes of 2016 and deliver a campaign that housing associations, supporters and politicians would be proud to champion. We produced a range of campaign resources to help you celebrate supported housing and you instantly got involved, planning activities and events. We saw amazing participation from a number of supporters who worked hard to make the campaign a success and effectively highlight how vital supported housing is. Starts at Home day on 1 September saw 36 MPs visit supported housing schemes where they could see first-hand the tremendous impact supported housing has on people’s lives. 1,366 of you sent nearly 3,400 tweets using the #startsathome hashtag which generated a potential reach of 2.4m. we told the powerful story of the diverse range of people who benefit from supported housing, through case studies featured on the Starts at Home website and shared on the National Housing Federation’s new Instagram account. On the back of Starts at Home day, we worked with Peter Aldous MP to organise a supported housing debate on 10 October in Westminster Hall. The debate saw a record number of MPs attend from different parties and unite with the sector. Through the Starts at Home campaign we’ve demonstrated the value of the sector coming together, but there is more to be done. We know that many supported housing schemes organise end of year festive celebrations for tenants and residents. This is a great opportunity to invite local politicians and decision makers to a scheme to meet your residents and staff and help them fully understand how supported housing benefits their constituents. 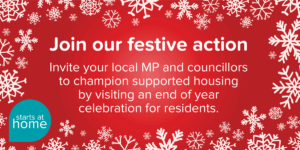 Invite local politicians to an end of year festive celebration at a supported housing scheme. Promote the visit in your social media using our Starts at Home festive graphic maker. We’ve received inspiring stories from housing associations across the country. Please do continue to send us case studies, particularly those that focus on residents living in short-term services and we’ll add them to our Stories page. You can submit a case study here. Looking ahead, the National Housing Federation will work with housing associations to keep MPs engaged with the Starts at Home campaign. Keep up to date at www.housing.org.uk/supportedhousing.